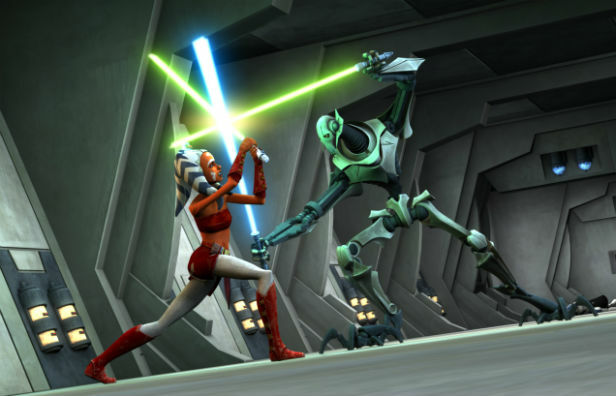 Was it important to you to bring out strong female character qualities in Ahsoka? I never really approached Ahsoka from the angle of ‘Oh, this is a strong female character, so I need to play her that way’, I was just so fortunate to be a small part of creating Ahsoka. The writing was superb, and [Dave Filoni and his crew] wrote such great episodes that I just had to bring life to the words that were on the page. The funny thing was that Ahsoka’s gender didn’t matter at the end of the day, because Dave didn’t write towards that, and I think that is the key to the success of writing a strong female character; just making her a strong character, male or female, and David and his crew did that. If you think about it, we never pointed out that she was a girl. I don’t think the term came up in the text, no one in the crew pointed out that she was a girl; she was just one of the gang, and I think the fans after a while looked past her gender. Did you have much input to her characterisation? I did have a lot of input with creating the character, her sound and attitude. Part of the reason I was cast was obviously the sound of my voice, but even just her attitude I brought to the auditions. Originally, Dave wanted Ahsoka to have an Icelandic accent. I didn’t do a good job in the original audition – in fact, I was terrible – I didn’t even think I would get a callback. Fortunately, I did, and once again they asked to prepare in an Icelandic accent. I went to the audition, read the first line in an accent, and they stopped me and said, “Okay, that’s still not quite right, we want you to more in an Icelandic accent.” I was so confused, because I was doing it in an Icelandic accent! And so I said, “I’m sorry, I am, so I’m not quite sure what you want!” They said that they liked my attitude and body movement, so I was cast a lot more just for being myself than my actual audition.